Alright. So these are so crazy yummy. I inhaled all of them within minutes and it's a true miracle I was able to hold off until I got some semi-decent photographs. 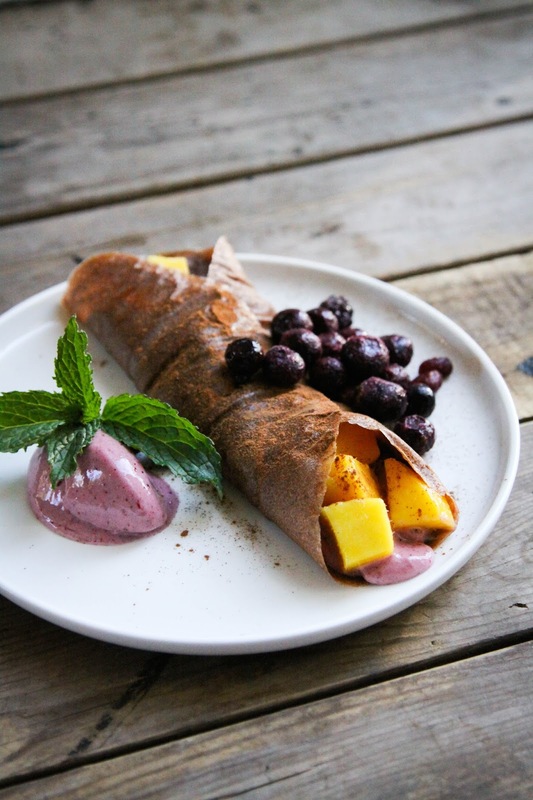 The crepes themselves taste like banana bread and if you roll them up they'd be a terrific, healthy and addicting snack wherever you go. If you can control yourself and not eat them all before you leave your dwelling, that is. I'm giving you the benefit of the doubt here. UNTIL TODAY. 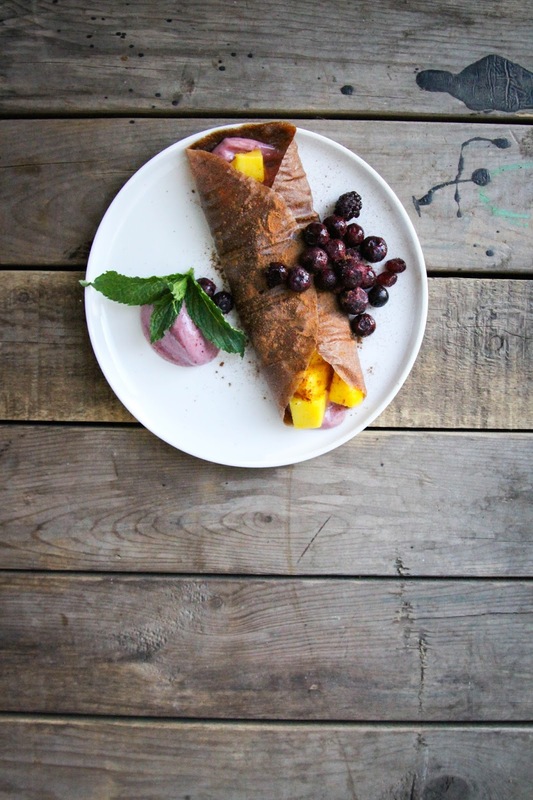 Or actually, a few months ago when I tried raw vegan crepes for the first time at Tao Organics in North Van. Another game changer, they were. Ever since then I have had them on my recipes-to-make list for da blog. And finally here today, I share my version (which happens to be low in fat and high in DAMN TASTY). As some of you know, I have gradually shifted to a high carb, low fat diet. Always made up of whole foods and 100% vegan of course, I have found I just feel best when I loooooaaaaddd up on carbs like fruit, rice and veg and minimize my consumption of stuff like coconut oil, nuts and seeds. These foods are GREAT and you should include them your diet, we just don't need that much of them. Or at least I don't. So this recipe doesn't have any high fat ingredients! Woo! All fruit, all the time. That's the way I like it. Let's inhale some crepes, baby. 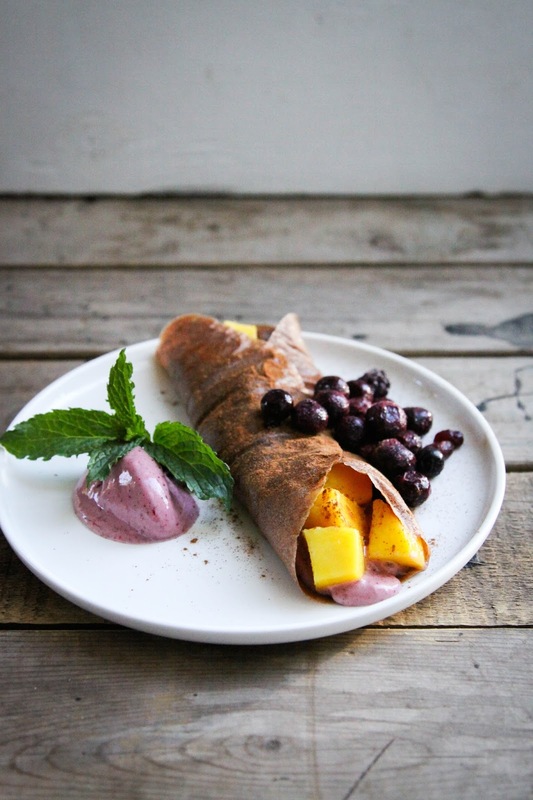 To make the crepes: blend the bananas with the cinnamon and coconut mylk until smooth. Pour into thin circles on parchment paper lined dehydrator trays (I used a 1/4 cup of batter per crepe), or baking pans, and "bake" in your dehydrator at 115 degrees for 3 1/2 hours or in your oven at its lowest temperature. The end result you want is crepes that don't stick on your finger and when you press on them. I tested mine throughout the "baking" process; for awhile the batter was still liquidy and my finger would just move it around, then it started getting more solid but when I poked it a little dough would stick to my finger and break off from the crepes, then finally I was able to press on the crepes and my finger came away clean. At this point, take them away from the heat and let them cool for 20-30 minutes. Gently pull them away from the parchment paper and there you go! 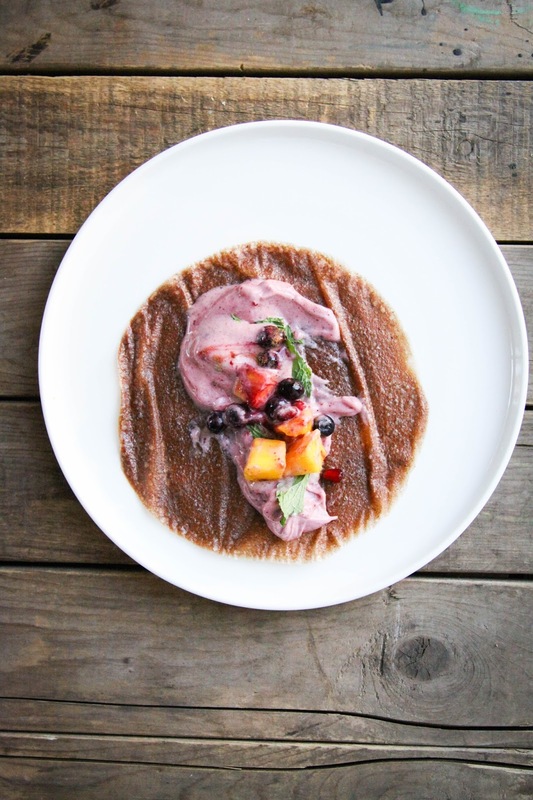 To make the ice cream: blend the bananas and berries until smooth. Spread this inside your crepes, along with the chopped fresh mango and berries, and decorate with cinnamon and mint leaves. I LOVE banana crepes! 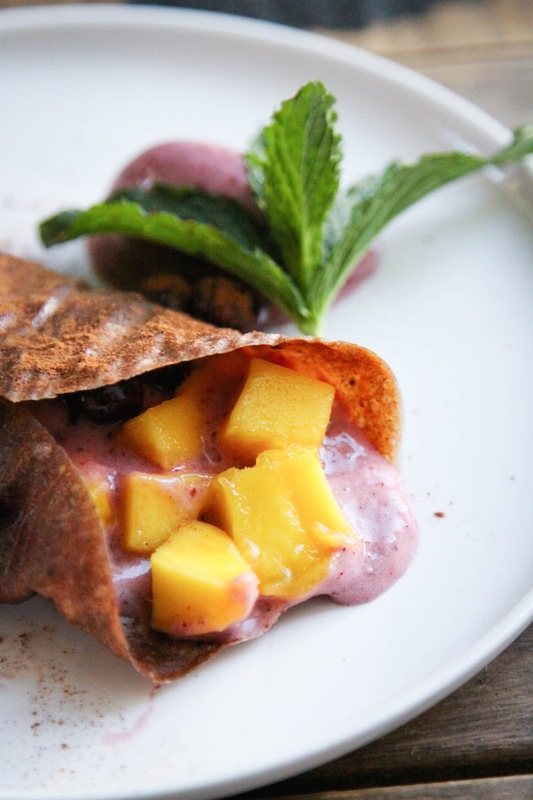 This makes me think of the delicious Cafe Gratitude dehydrated banana crepe dish! I'm so happy that this one is low fat, and keep going, your high carb recipes are very interesting! Oh my goodness, Emily! This recipe look amazing. I am in the midst of a really rough month (I'm a high school junior preparing for AP exams), and this recipe totally made my week. Seriously. I saw the post while I was at school, and I couldn't wait to get home so I would take the time to look over this recipe and share it with my parents. I know I'll have to make time soon to prepare myself these crepes - maybe as a post-exam party for myself? Thank you! Can I ask something stupid? By frozen bananas, do you actually mean freezing a whole banana in the freezer? Doesn't that break the food processor? Depending on the type of high speed blender you have, it can be a good idea to break/cut the peeled bananas into smaller segments (I usually cut them into 1 inch segments) then freeze them as this is much easier on your blender. If you have a vitamix or equivalent then you shouldn't have any problems. Sometimes you will also need to add some water or coconut milk/ nut milk to get it going (again this depends on the type of blender you have). Wow, finally a website that gets how I want to eat, you nail it!! I feel great on raw food, but I want some cooked things from time to time, like every night, especially in winter! And low fat too? You make my little heart sing. We eat incredibly healthy plant based food, low fat and unprocessed. I wish my husband and I discovered this years ago, we could have avoided so many of his truly scary health issues. Thanks for the gorgeous photos, keep it up. Romaine calm and vegan on! Woah! 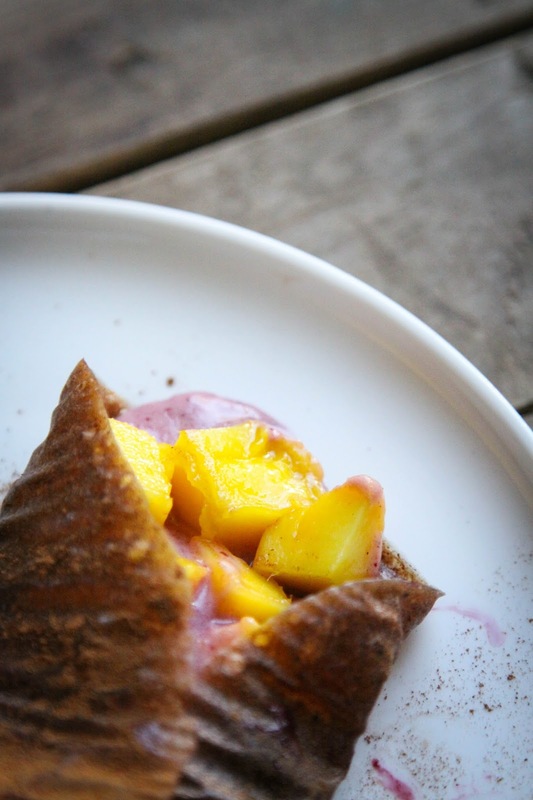 Too weird I just made banana crepes last night and had them this mornin with fermented cashew cream cheese, and raspberry chia jam, maybe I'll have a mango one for lunch! You always have such beautiful recipes and photos- can't wait to give this a try!